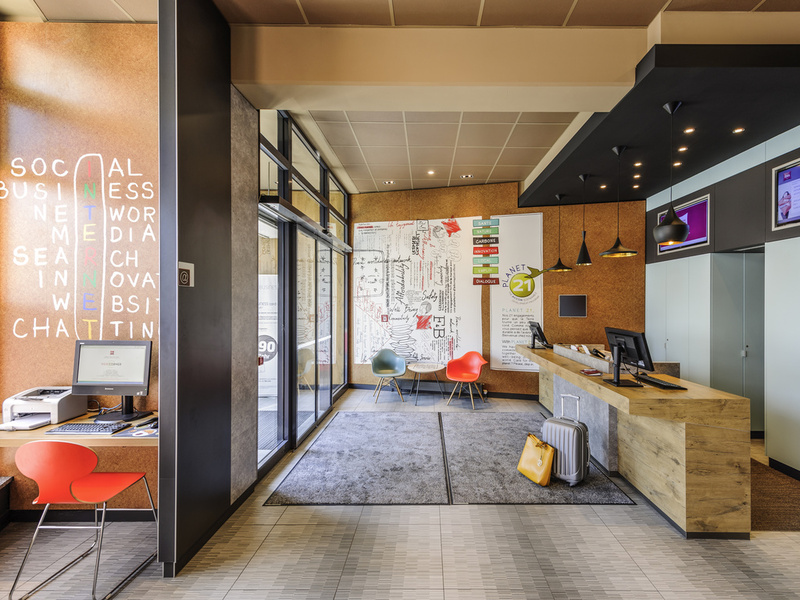 Hotel ibis Jena City. Book your hotel in Jena now! Really lovely to be recognised and feel welcomed back again. Thank you Jenny. Friendly staff and especially the reception personnel. Great breakfast with everything you need to start your day. Comfortable bed. IBIS is a good choice for Jena as it is in the city. Hotel equipement is basic but ok. I like to go there as my preferred hotel as it is in the city center with access to restaurants and shops and within walking distance to the train station. The rooms are small, standardized and fairly well kept. The bathrooms are cabinets whith quite a step to enter them (I am always wondering, when I trip and fall during the night) and they do not offer a lot of room, the toilet bowl is uncomfortably small. Shower is ok, but the water spills over the whole floor. For electricity to work you need to put your card key (or any credit card sized card) in a slot at the door, which is nice for the environment but a bit silly, if you expect your devices to be charged during your absence. Internet is ok. Breakfast is 3 out of 5 stars, the fruit salad is not attractive as it floats in a lot of water and sometimes tastes bubbly, as if it has already started to ferment. Rolls are sub-standard, but cut yourself bread is ok.
Lovely. I visit Jena 3-4 times a year, and I choose this hotel for the staff. They are very welcoming. They help when needed, and are friendly when you fancy some company. My room was not cleaned on two consecutive days. I complained but the reception staff said that there were just two cleaners for 40 rooms. This does not help me as a customer. Additionally on the last day there was very loud building work taking place all afternoon. Very comfortable stay in the city centre. Nice stay, very clean room. Wish more changes of breakfast, and a kettle in room. It was generally nice. One problem is that the room did not have a water boiler, which is a pity. Moreover, in very hot days, the available blanket was very thick and not at all appropriate for the season. Atende as expectativas, limpo e organizado. Quiet, comfortable, close to shops and trams. Just what we needed. Disappointed at no room kettle, and cups to make some tea. Bathroom fan not working. Beds and linen very good. reasonable place to stay in central location; but that you charge for coffee and don't provide facilities in the rooms is a bit cheap. I had a decent and clean room with a comfortable bed and the room service made sure that everything was cleaned and arranged every day. The staff was friendly. Only thing i could complain about is the breakfast which could have more choices. Pleasant stay with free WIFI (be it restricted speed wise). Clean rooms with comfortable bed. Breakfast average choice, hot and cold. Well located in the centre of Jena close to shops restaurants and bars. Perfect size room, spacious bathroom and very helpful staff.